I love watching fifth graders — that's just about the time this happens — casually but insistently slide away from their parents while entering school, transmitting the message, "I am growing up, and I (think) am ready to be more independent." This can come as a surprise to many parents. 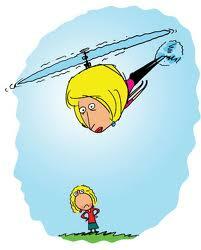 "Confessions of a Helicopter Mom" is a cute essay from last Sunday's NYTimes Magazine. Some parents have a tough time letting go when it is time.